If you are shopping for a new vehicle and aren't sure where to begin, you may want to think about the interior of the vehicle. After all, this is where you will be spending most of your time while you are driving. When it comes to the Ford Focus ST, there is a lot to take in on the interior. Similar to its clean and simple exterior design, this vehicle's interior is also very simple yet comfortable. The interior materials are high quality but are pretty consistent and simple throughout. The controls are all centrally located and conveniently placed where you need them. Cargo space is ample inside of the Focus ST. You can easily drive this vehicle to and from work each day and its adequate enough to be a family vehicle if you desire. 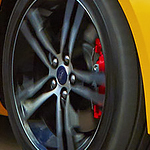 Stop by Malloy Ford today to find out more about the Ford Focus ST.